Note: Please specify desired soap and water controls when ordering. A thermostatically controlled mixing valve ensures the proper water temperature. High side panels control splashing. Drain connection is 3.8cm (11/2"). 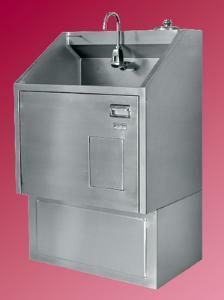 Double scrub stations feature a Plexiglas® screen in between the two faucets. Water may be operated by a hands-free infrared sensor, knee/thigh-operated push panel, or foot pedal. Soap may be dispensed via a knee/thigh-operated panel, foot pump, or hand pump. Ordering information: Optional accessories include a battery-operated or mechanical dial timer, a fluorescent light fixture, and a bottom skirt for concealing plumbing lines; contact your VWR sales representative for more information.